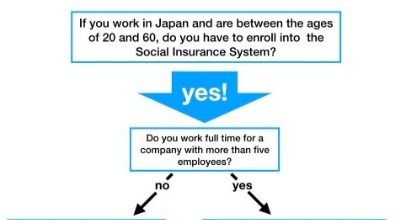 In Japan the social insurance system is standardized throughout the country, and registration and paperwork is handled at local offices in each Ward. 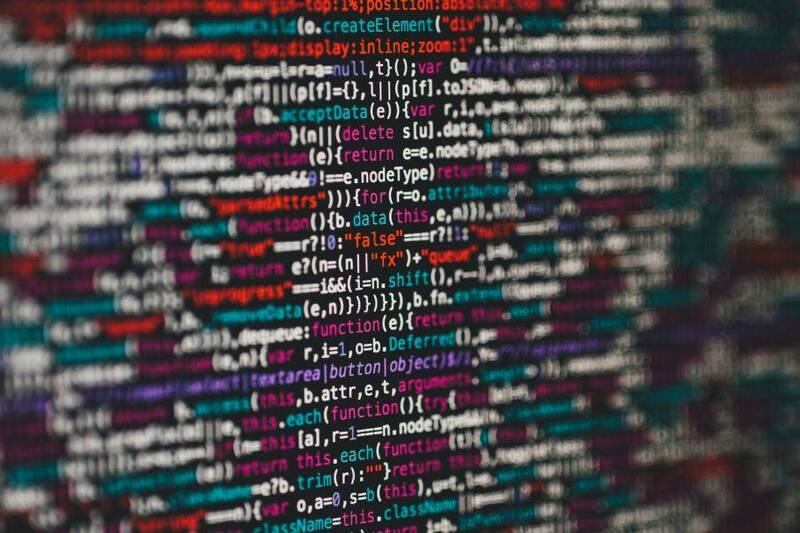 Here is a breakdown of the Japanese Health and Pension Insurance systems with links to relevant government websites with additional information. Regardless of nationality, all residents of Japan between the ages of 20 and 60 are required to enroll into a Social Insurance program. What’s the difference between Kokumin Nenkin and Kousei Nenkin? Kokumin Nenkin (National Pension - 国民年金) is a national pension plan that individual scan enroll into. If you work for yourself or part time (less than 30 hours a week) or for a company that has less than 5 employees your pension is not tied to your work, and thus you as an individual are required to enter into the Kokumin Nenkin program. As of 2018 the monthly payment is ¥16,340; discounts are available if payments are made in lump-sums for 6 months or one-year. 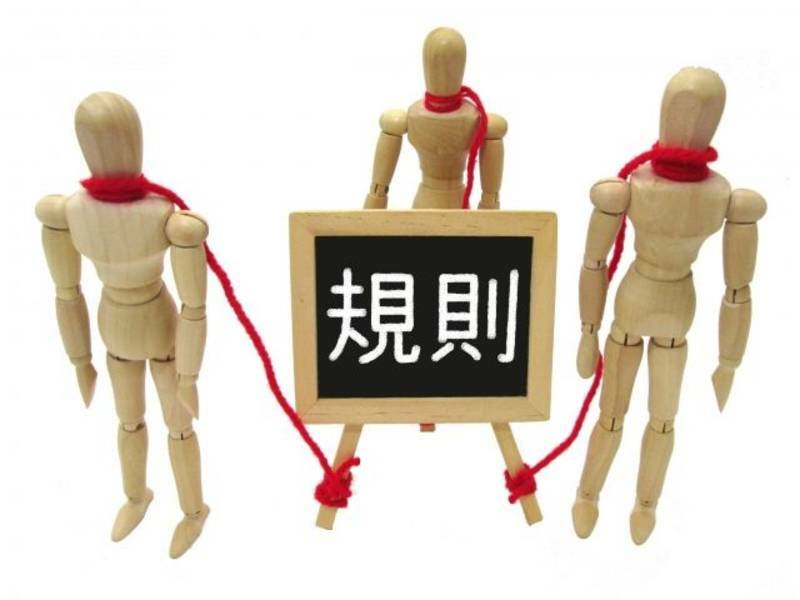 Kousei Nenkin (Employee’s Pension - 厚生年金) is a pension system that is linked to your work. Your company is required to automatically deduct 9.15 percent of your monthly salary for your pension and then match the amount. The main benefit of this system is that your pension payments after the age of 65 will be higher. Some Japanese people choose to enroll into the Kokumin Nenkin program in addition to the Kousei Nenkin provided by their companies to receive a larger pension upon retirement. There are 18 countries with active pension agreements with Japan. They are: Germany, United Kingdom, Republic of Korea, United States, Belgium, France, Canada, Australia, Netherlands, Czech Republic, Spain, Ireland, Brazil, Switzerland, Hungary, India, Luxembourg and The Philippines. Three more have signed agreements that are in the process of being implemented (Italy, Slovak Republic, China). The agreements differ from country to country so for details please go to the Japan Pension Service website, or check with your local embassy. The only other exception is age. 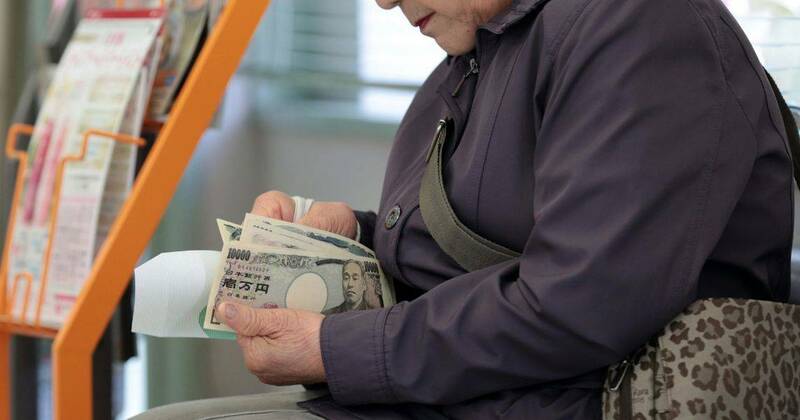 Amended in 2018, the Japanese Pension system requires 10 years of payments to be made into the system in order to receive pension benefits after the age of 65. 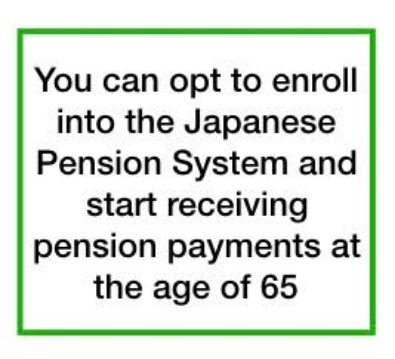 This means that if you arrive in Japan at the age of 60 or older you are exempt from enrolling into the a Japanese Pension program. 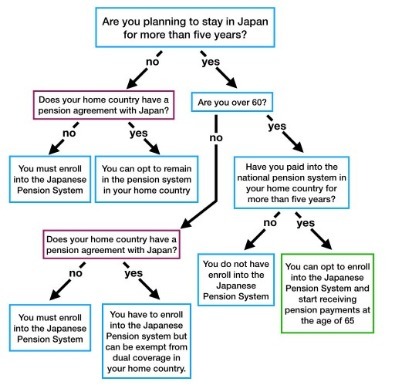 However, if you have been paying pension in your home country for more than five years and you country has an agreement with Japan, the culmination will be acknowledged as 10 years of pension payments and at the age of 65 you will be entitled to pension benefits in Japan. 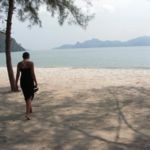 However, the benefits will only be calculated by the amounts paid into the Japanese system, and not as a total of your overall pension payments in your home country. 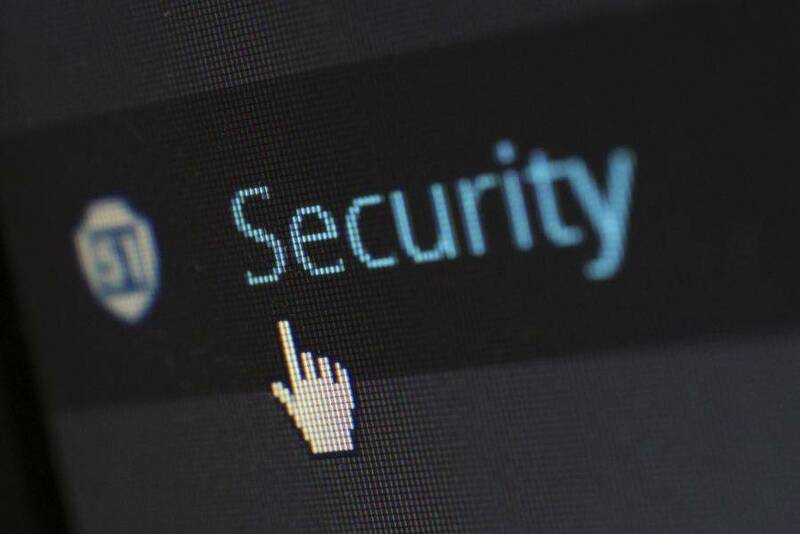 Again, the agreements vary from country to country so it is always best go to the Japan Pension Service website, or check with your local embassy. 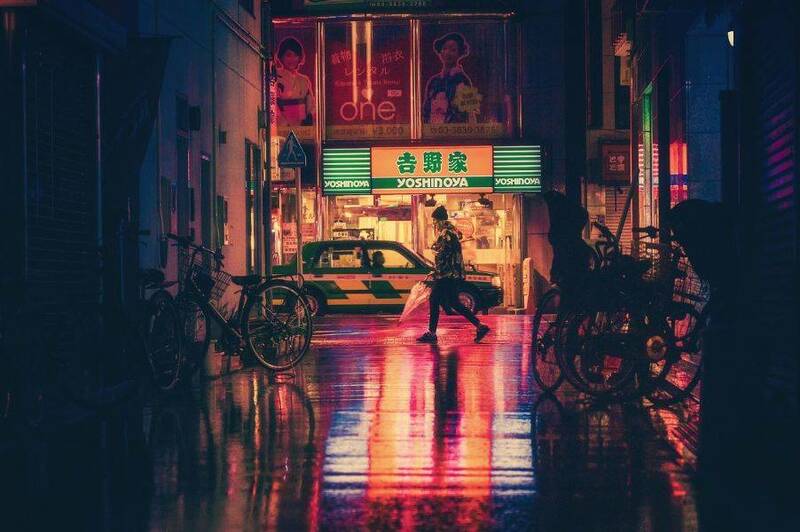 What happens if you leave Japan for good? When you leave Japan, you must terminate your Japanese residential status. From this date of termination you have 2 years to file for a lump-sum withdrawal of your pension payments. The maximum amount of time for reimbursement is capped at 36 months. The amount that is refunded is subject to income and other taxes and consequently the amount that is returned may be half or less than the amount that was paid into the system. For a an in-depth explanation please read the following PDF from the Japan pension service’s website. And click here for additional information about pension in Japan. Regardless of nationality, all residents of Japan, staying for a period of 3 months or more, should be enrolled in either the Employee Health Insurance (Kenkou Hoken - 健康保険) or National Health Insurance (Kokumin Kenkou Hoken - 国民健康保険) systems. 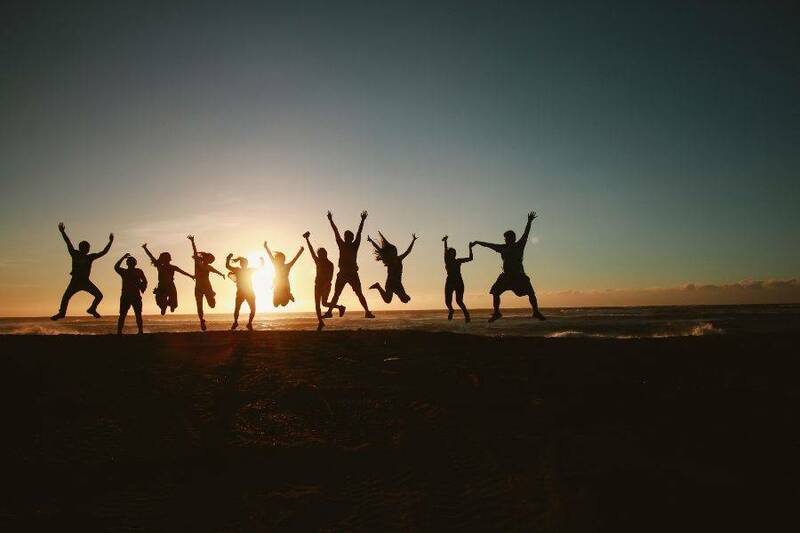 As with the national social insurance, if you work full time (more than 30 hours a week) for a company with more than 5 employees your employer is required by law to register you and your dependents into the Employee Health Insurance (EHI) program. For more information about who qualifies as a dependent please read the following explanation on the Japan Pension Service website. If you work for yourself or work part time, you should register yourself into the National Health Insurance (NHI) program. 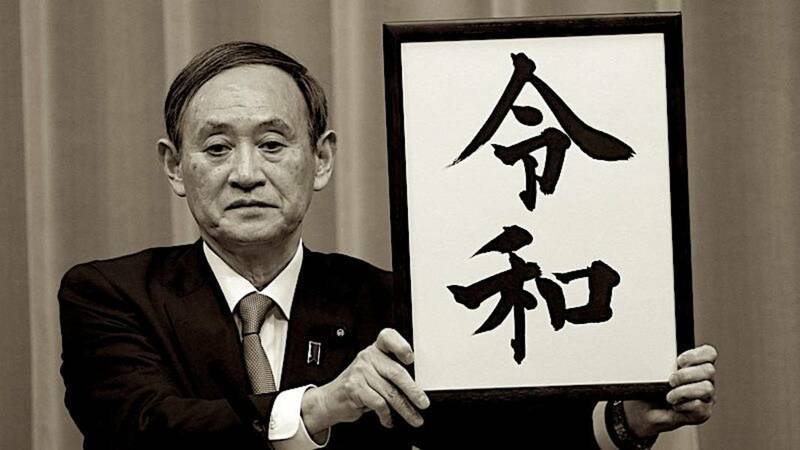 Finally if you are over the age of 75 you are entitled to resister for the National Medical Care system for the aged called Koki Koureisha Iryo Seido (後期高齢者医療制度). 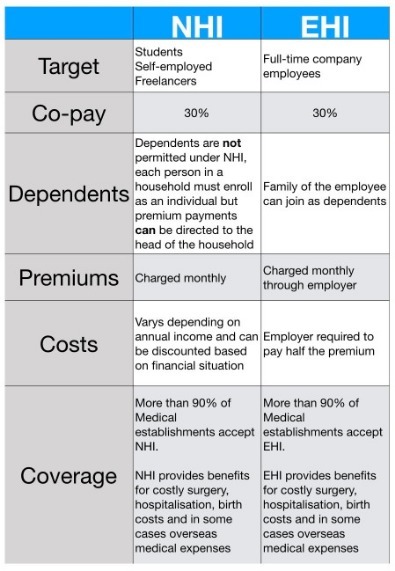 What’s the difference between NHI and EHI? Who is exempt from entering one of the Japanese Health Insurance programs? There are a few cases where people are legally exempt from entering one of the Japanese health insurance programs. 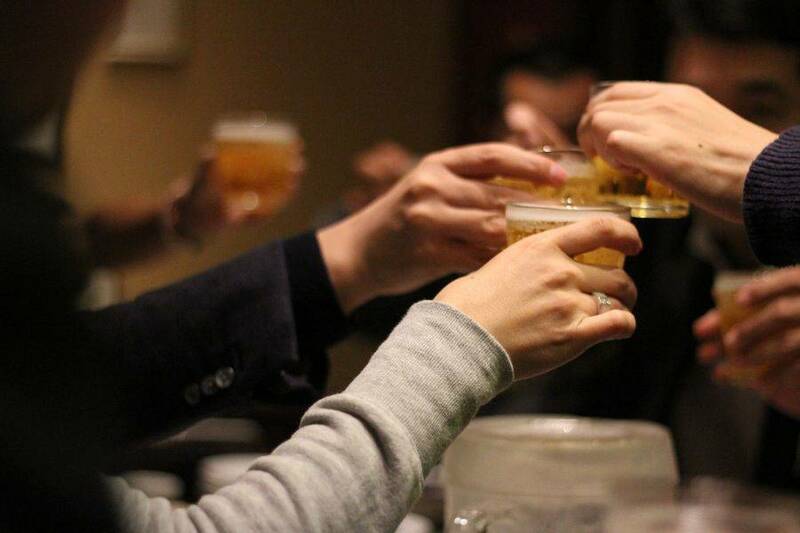 Those from countries with pension agreements with Japan who plan to stay in Japan for less than three years. 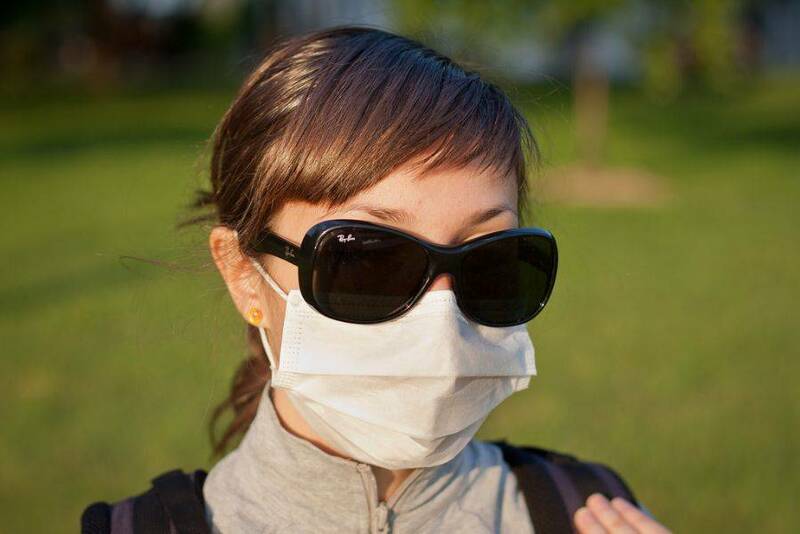 Legally there are no penalties for not entering one of the Japanese health insurance programs, and some foreigners do indeed take the risk and opt out of having health coverage in Japan. The consequence of this merely that in the event you need to visit the doctor, all payments must be made upfront in full. Choosing this is of course an option, and since the medical system in Japan isn’t exorbitantly expensive minor illnesses will not bankrupt you. But, the medical insurance system is Japan is reasonable and reliable so there really isn’t a down side to being covered in case you fall somewhere, break your leg and end up needing surgery. Above we have outlined the major points of the pension and health insurance systems in Japan. It is true that the systems are designed for those who stay in Japan for extended periods of time and is not as beneficial for those planning to stay in Japan for short periods. In addition the rules of the pension and health insurance systems are changing constantly because of the expense of Japan’s aging population. The following information is the most recent available from Japan Pension Service that was recently updated in August 2018. As foreigners in Japan it is our responsibility to keep track of the changes and how it affects our premiums, payments, and future.The latest information is always available on the Japan Pension Service’s website. As always, feel free to open an account in Izanau.com if you want to apply for jobs in Japan!